Image credit: Paul Hudson. 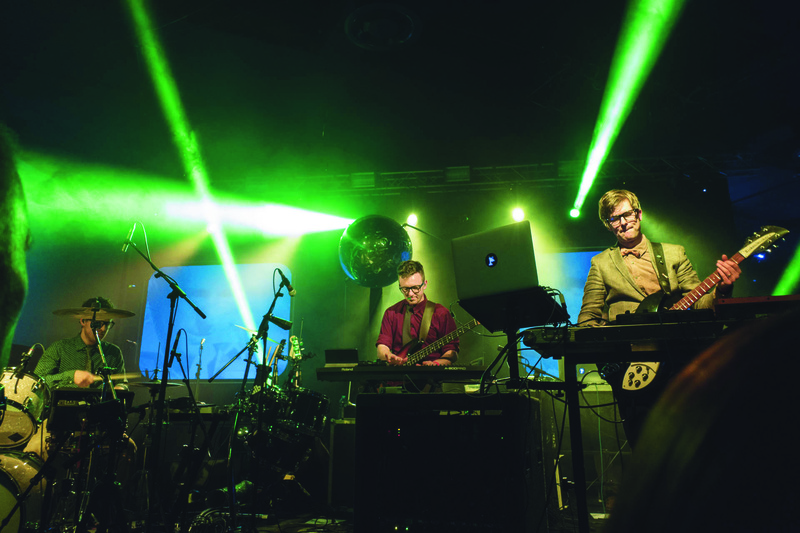 Description: Public Service Broadcasting in performance. For those of us still reeling from Every Valley, getting news of Public Service Broadcasting’s new EP was like a punch in the face from the muse herself. White Star Liner is PSB’s second EP and tackles the Titanic, both semi-literally and metaphorically. It’s undeniable that White Star Liner takes us on a journey, one entirely chronological; the first two songs, roughly half the EP’s total length, fall before the Titanic’s collision, the latter two afterward. ‘The Unsinkable Ship’ is… honestly, not that great. As an opener, it’s almost indistinguishable from Every Valley’s title track, from the crescendo’ing strings at the start, to the slow build-up of a mournful, guitar-driven soundscape with droning brass and unrelenting drums, all overlaid with a local man’s reminiscence about his romanticised childhood memories of the glory days of the album’s subject. This is fantastic once. Twice is a bit much. For those of us still reeling from Every Valley, getting news of Public Service Broadcasting’s new EP was like a punch in the face from the muse herself. Very disappointingly, the title track is also extremely reminiscent of Every Valley, this time ‘Progress’. The rhythm of the rhythm guitar on ‘White Star Liner’ is almost identical, albeit slowed down, to the drums on ‘Progress’; both feature heavily edited, electronic female voices repeating a phrase in the background, and narration of how impressive this new technology (which now sounds quaint) is and how much of an impact it will have. This will revolutionise everything we thought we knew about cruise travel/mining. Not. Now to the sad ones. ‘C-Q-D’ is, in my opinion, the best track of the lot (closely followed by the last one). Named for the distress signal used by the Titanic, it is emotive, orchestrated, intimate, professional; the echoing groans of hull fade in and out against a tight backdrop, PSB at their best. Words aren’t needed to convey this moment: we all know what this song represents. It’s certainly telling that the small sample used in this song is right at the end and already, we are retrospective. As the song dies, the tremble in his voice gets one last rise out of us, no swell in the music needed. And, finally, ‘The Deep’. This is fairly close to ‘Waltz for George’ off their first EP The War Room in a number of ways, but it’s also my personal favourite, if ‘C-Q-D’ is objectively the best track. It’s beautifully simple, like wind whistling on a cold night at sea – Public Service Broadcasting are at their finest when writing eulogies. The divergence from Every Valley is striking. Where ‘Take Me Home’ ended on positivity, showcasing the surviving culture and spirit of the communities whose tale Every Valley told, White Star Liner has no happy ending, and nor should it. White Star Liner, or rather the collection of songs which were made into it, was written on commission for BBC Music. They call it a “suite of songs”; Willgoose calls them “pieces of music”, no more or less. It’s this tension that makes it less than fantastic (which is naturally the standard to which I hold them by this point) – is it an EP, or a collection of songs, or both, or neither? By comparison one last time to Every Valley, White Star Liner suffers on account of having less than a third of the length and no smaller a narrative to fit into it. Their usual tactic – long, weaving, ebbing songs interspersed with individual stories and detail pieces like ‘You + Me’ or ‘Valentina’ – doesn’t work here; there just isn’t room (and even The War Room got five tracks). By trying to do both, they achieve the full potential of neither.